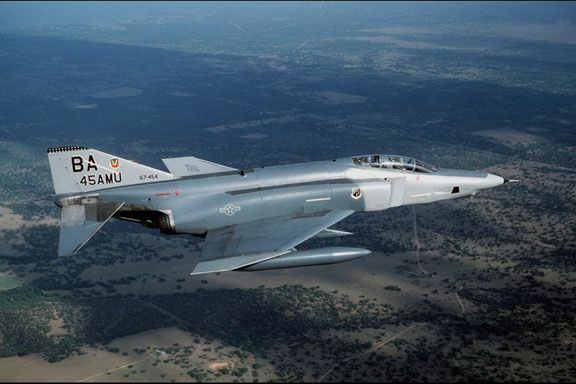 The McDonnell two-place, twin jet, all-weather F-4 Phantom II, with top speeds more than twice that of the speed of sound, was one of the most versatile fighters ever built. A fast and powerful aircraft that proved itself in roles such as interceptor, air-superiority fighter, attack aircraft, and reconnaissance platform. 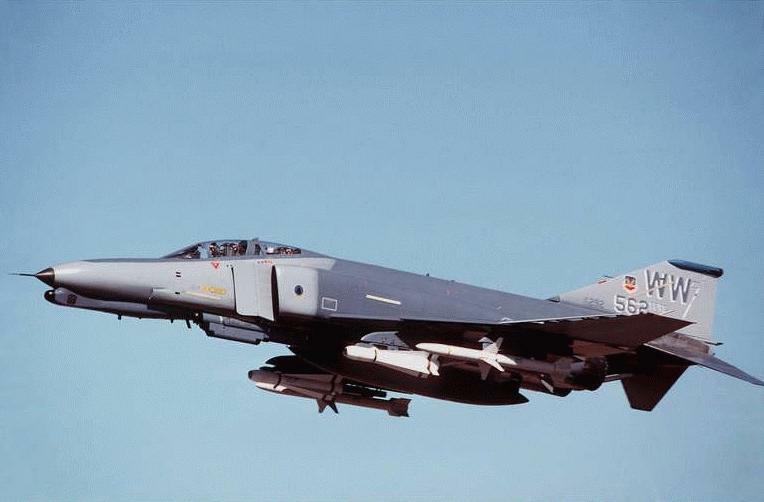 The F-4 was built in large quantities, had a significant combat history, and still remains in service with a number of foreign air arms, over 40 years after its introduction. 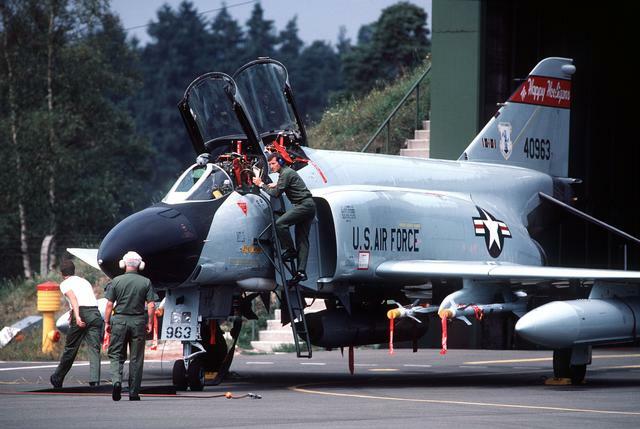 The F-4 was put into service by the Air Force and Navy serving a variety of roles in the Vietnam conflict. 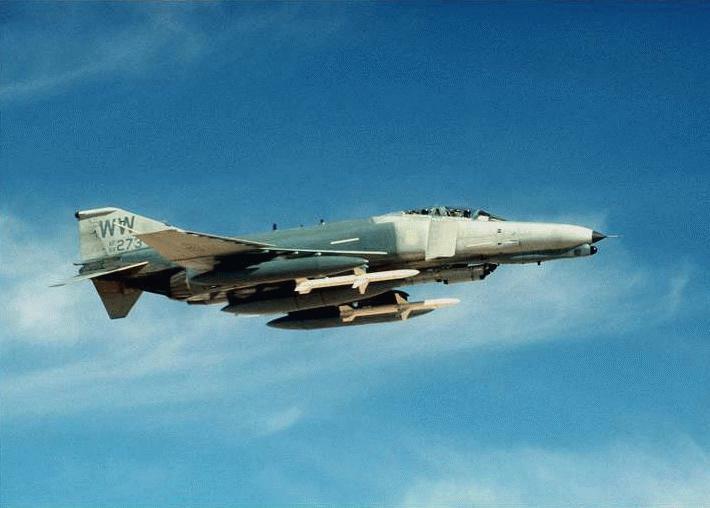 The final application of the F-4 by the U.S. was in the “Wild Weasel” role for suppressing enemy air defense systems. 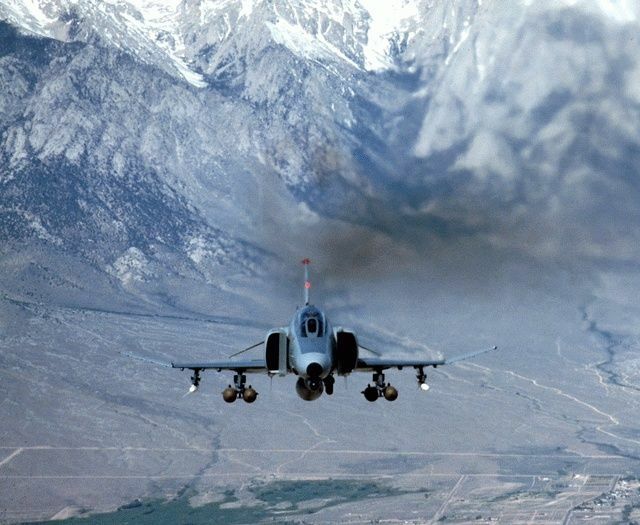 F-4 production ended in 1979 after over 5,000 had been built-more than 2,600 for the U.S. Air Force, about 1,200 for the U.S. Navy and U.S. Marine Corps, and the rest for friendly foreign nations. Later versions of the aircraft were in the U.S. Air Force inventory until December 1995. Under its own financing and initiative, McDonnell Aircraft began developing an all-weather attack fighter in August 1953, shortly after it lost a competitive bid to build a Navy supersonic air-superiority fighter. McDonnell had already produced more than 1,000 carrier-based jet aircraft, the FH-1 Phantom, the F2H Banshee and the F3H Demon. In 1954, the Navy selected McDonnell Aircraft to begin production of the fighter, designated the F4H, which was to be a fleet defense fighter that could take off from an aircraft carrier, have a cruise distance of 250 mi, intercept intruders, and then return to the carrier 3 hr after takeoff. The aircraft was to be armed with missiles and would not carry guns. 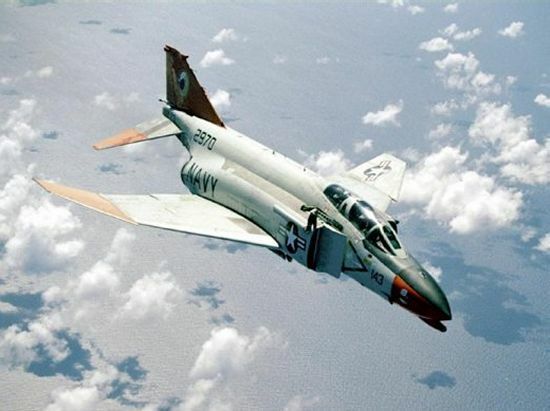 It would operate as a high-speed (Mach number of 2), standoff missile launcher that would not engage in close-in combat. . Just 31 months after its first flight, the F-4 was the U.S. Navy’s fastest, highest-flying and longest-range fighter. It first flew May 27, 1958, and entered service in 1961. It was named Phantom II on July 3, 1959, during a ceremony held at the McDonnell plant in St. Louis, Mo., to celebrate the company’s 20th anniversary. During the first few years of the Vietnam conflict, the U.S. found itself engaging enemy aircraft such as the MiG-17 and MiG-19 that were relatively agile and could easily outmaneuver the heavier U.S. aircraft (F-4 and F-105) that had been designed without requirements for close dogfighting or close weapons such as a gun. Initial tactics used by U.S. pilots to try and turn with enemy aircraft had been relatively unsuccessful, and it had become apparent that missiles in use at that time were relatively unreliable at long ranges. Pilot training and revised tactics were ultimately employed to blunt the threat and use U.S. aircraft to an advantage, but the lack of maneuverability and a gun for close-in combat became issues for the Air Force. A new Air Force version known as the F-4E was equipped with a nose mounted M61 cannon, and additional deliveries to the Air Force began in October 1967. Both U.S. military flight demonstration teams, the Navy Blue Angels and the Air Force Thunderbirds, flew the Phantom II from 1969 to 1973. 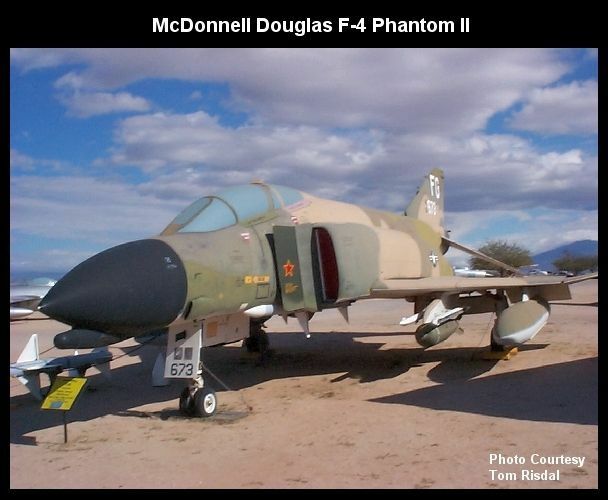 The 5,000th Phantom was delivered on May 24, 1978, in ceremonies that also marked the 20th anniversary of the fighter’s first flight, and McDonnell Douglas delivered the last St. Louis-built Phantom II in October 1979. By 1998, approximately 800 were still in service around the world. 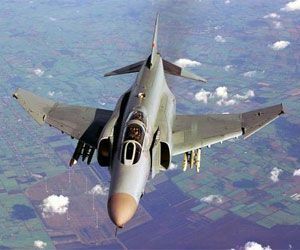 With the upgrades already performed and those under contract, the F-4 Phantom II will probably still be flying in 2015 — nearly 60 years after its first flight. The Navy fighter garnered a host of world speed and time-to-climb records. On 06 December 1959 Commander L.E. Flint, piloting a McDonnell F4H-1 Phantom II powered by two GE J-79 engines bettered the existing world altitude record by reaching 98,560 feet over Edwards Air Force Base.